This story reveals some important aspects of Jesus’ understanding of God and man. Apparently, according to Jesus, God blesses those who are sick, those who suffer – in short: the victims. Not because they are victims per se, but because they are in fact fellow human beings and their suffering is regarded as unjust. This belief in a God who regards victims as human beings who suffer unjustly is exemplified by the healing activity of Jesus, which consists in opening up the possibility for these victims to become part of the (human) community again. Since Jesus reverses the idea that victims are condemned (or “chosen”) by some divine command to suffer, but insists that God actually blesses and “chooses” them as human beings, he takes away the reasons for their marginalization, or persecution and expulsion. Moreover, he takes away, at the same time, the traditional means by which communities structure themselves, and challenges them to include those they experience as a threat, a disgrace or even as an enemy. As the story turns out, the blind man saw something that the people of his community and Jesus’ disciples remained blind to. 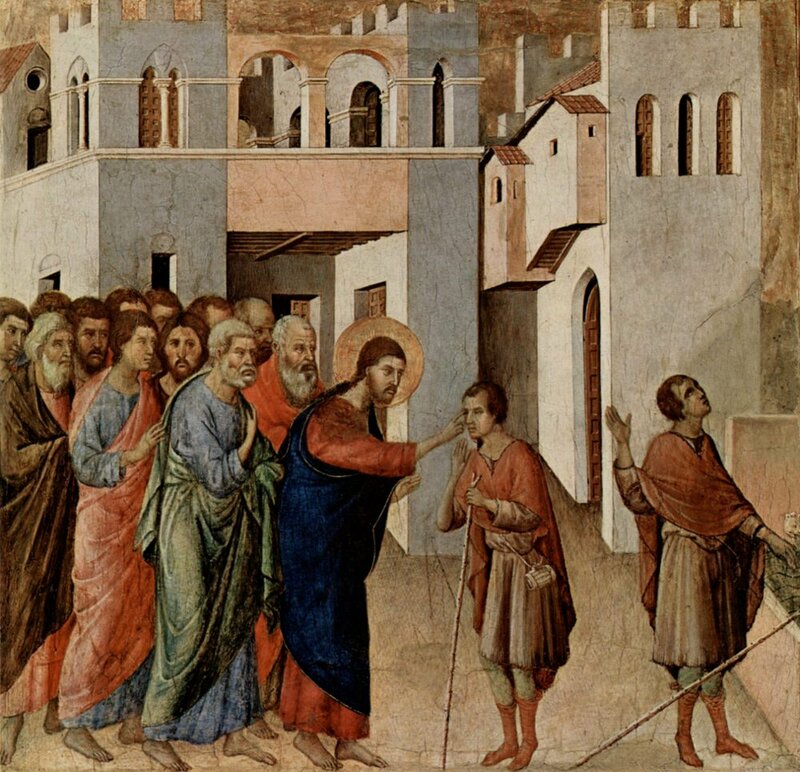 Jesus paradoxically accomplishes that the actual sinfulness is no longer located in the blind man, but rather in what had been the (rather unwitting) complicity of the individual members of an entire community to take part in mechanisms of expulsion. Ever since the traditions of the Gospel spread in western culture, being a victim was gradually no longer experienced as an inevitable and sacred “state of affairs”, nor as a disgrace or something to be ashamed of. Western civilizations developed a growing active and moral concern for victims in the course of their history. Sadly, however, the search for victims all too often became a perversion of Christ’s healing activity. Sometimes we use the claim of being a victim to victimize others and to perpetuate mechanisms of exclusion. Not surprisingly, René Girard and Gil Bailie have some very insightful thoughts on the matter. “We have experienced various forms of totalitarianism that openly denied Christian principles. There has been the totalitarianism of the Left, which tried to outflank Christianity; and there has been totalitarianism of the Right, like Nazism, which found Christianity too soft on victims. This kind of totalitarianism is not only alive but it also has a great future. There will probably be some thinkers in the future who will reformulate this principle in a politically correct fashion, in more virulent forms, which will be more anti-Christian, albeit in an ultra-Christian caricature. When I say more Christian and more anti-Christian, I imply the figure of the Anti-Christ. The Anti-Christ is nothing but that: it is the ideology that attempts to outchristianize Christianity, that imitates Christianity in a spirit of rivalry. “There’s plenty of truth in the revised picture of Western history that the young are now routinely taught, the picture of the West’s swashbuckling appetite for power, wealth, and dominion. What’s to be noted is that it is we, and not our cultural adversaries, who are teaching it to them. It is we, the spiritual beneficiaries of that less than always edifying history, who automatically empathize more with our ancestors’ victims than with our ancestors themselves. If we are tempted to think that this amazing shift is the product of our own moral achievement, all we have to do is look around at how shamelessly we exploit it for a little power, wealth, and dominion of our own. Just a few days ago I came across an example of this dynamic, i.e. the dynamic of proclaiming oneself as a victim and of having certain rights to persecute “evil others” because of it. Extreme right wing and nationalist parties, among others, often use the tactic of presenting themselves and their followers as victims to make certain political and social claims. In Belgium and in the Netherlands this is called the “Calimero-complex”. The cartoon character Calimero is a hapless chick, fresh out of the egg, whose famous line is: “This is not fair; they are big and I am small.” Hence the “Calimero-complex” is used to denote persons who think the world is against them, and who revel in an underdog role. So, what happened? Well, a few days ago I visited some friends in Antwerp, one of the big cities in Belgium, in Flanders. That’s where I saw this poster of the extreme right wing and Flemish nationalist party “Vlaams Belang” (“Flemish Interest”). It portrayed a caricature of “Lamb of God”, the beautiful 15th century painting by the Van Eyck brothers (conserved at Saint Bavo Cathedral, Ghent). 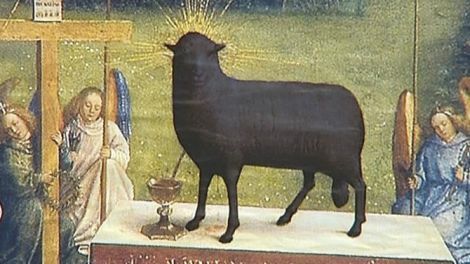 The lamb was depicted in a black color, instead of white, thereby reinforcing the stereotypical connotation that “blacks are bad”. The poster was accompanied with slogans to warn certain people to “stay away from our country”, namely “impostors [abusing the system to seek asylum], illegal immigrants, Islamists, criminal foreigners”. The poster suggests that the people mentioned defile our cultural identity and heritage, and that they are no innocent lambs or wrongfully accused scapegoats. Filip Dewinter, leading figure of Vlaams Belang, claims that the posters were in no way issued by his party and is filing a complaint. According to him, the unknowns who did issue the poster are trying to blackguard his party, presenting illegal immigrants and others as people who are targeted as “black sheep” by Vlaams Belang. Filip Dewinter suggests that his party falls victim to a campaign that reverses what is actually happening. According to him, Vlaams Belang indeed has every right, even a duty, to defend the country against illegal immigrants and the like, and these people shouldn’t be depicted as “black sheep” or victims. I guess the real victims of these quarrels stay out of sight. The ones who have to flee their home-country, who have no real options, but are labeled as “illegal immigrants” all the same. 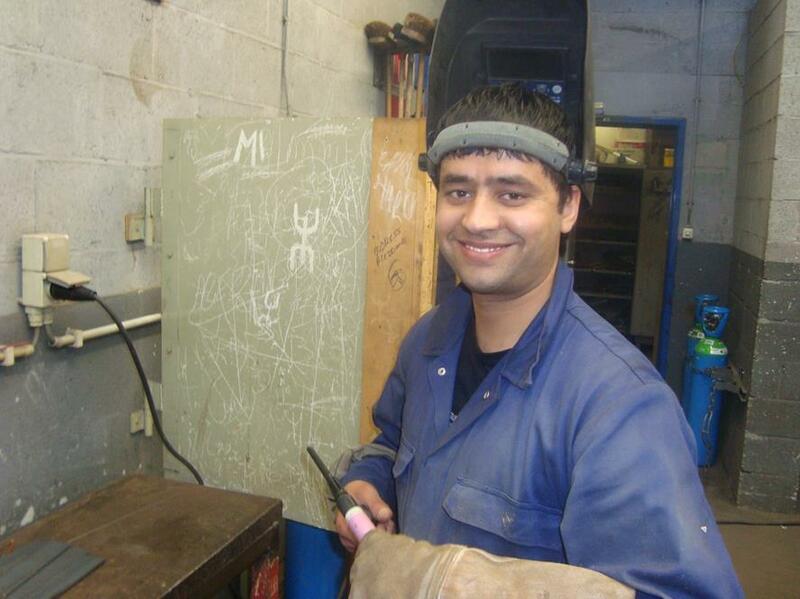 Just the beginning of this month, Parwais Sangari, a young promising Afghan and in no way a criminal, had to leave our country to return to Kabul – you know, the place where you wouldn’t send your children on a holiday these days… Twenty year old Sangari had foster parents here. Nevertheless he was sent away to walk around aimlessly, without any real home, in the Afghan capital – after four years in Belgium. Still there’s hope. As it turns out, we’re not completely blinded by “the atmosphere of fear” we’re creating in our politics. Some people have started campaigns in favor of people like Sangari, demanding to reconsider our general asylum and migration policies. How blinded are we? Are we capable of noticing the Victim? Can we stand the light that shines in our darkness? Can we allow ourselves to be blinded by its splendor, to see with new eyes and new hearts? 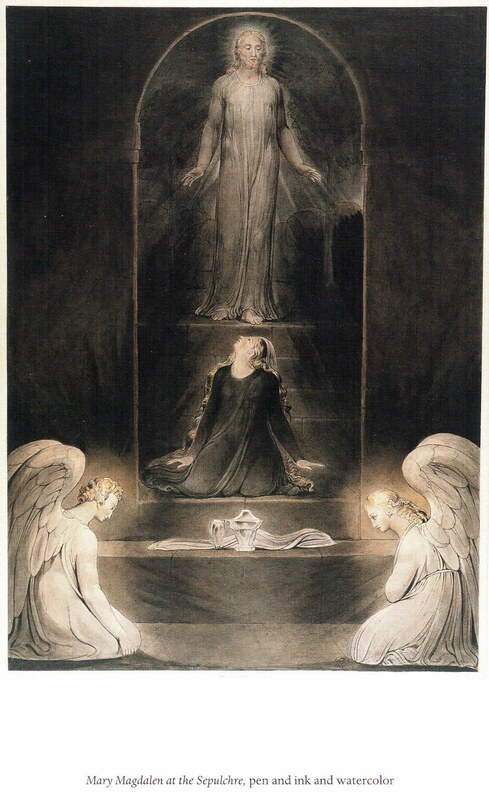 William Blake (1757 – 1827) is one of the most intriguing artists ever to have walked the face of this earth. An English poet and painter, he conceived his own mythology, rich in symbolism and meaning, based on a thorough knowledge of Classical Antiquity and the Biblical traditions. I first became attracted to his work by reading Gil Bailie’s book Violence Unveiled – Humanity at the Crossroads. 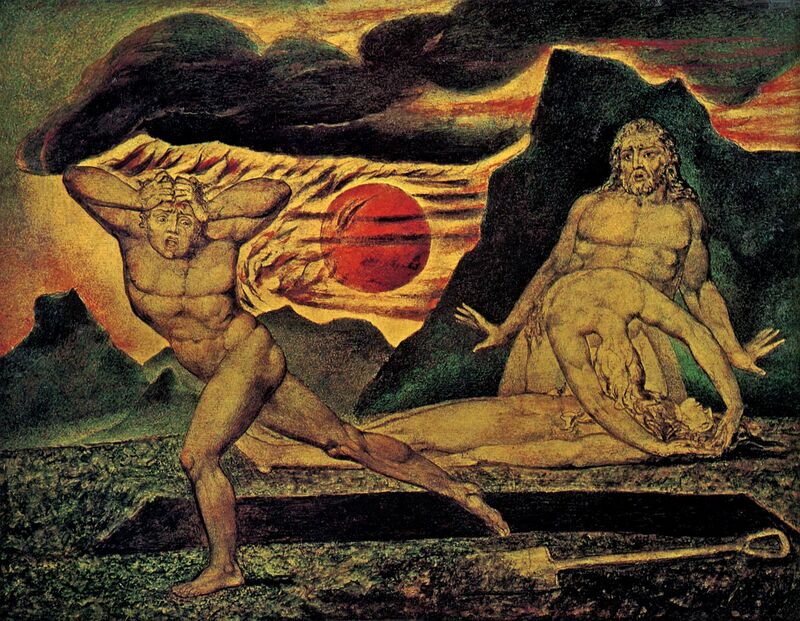 The cover showed The Body of Abel Found by Adam and Eve, one of William Blake’s later paintings. Struck by this powerful image and the equally powerful writings of Bailie, I delved into some of Blake’s poems. I knew he took a critical stance toward organised religion, as well as toward an idealization or ‘idolization’ of Reason. Perhaps most remarkable, William Blake shows a profound understanding with regard to the origin of ‘resentment’ in this poem. We all have the tendency to look out for what is socially acceptable, be it consciously or unconsciously. Depending on the particular group we want to be part of, we imitate certain behaviors and clothing styles. Likewise, we even hang on to certain ideas, rules and norms, defining what is morally ‘good’ or ‘bad’ for our particular group. It’s, in a sense, ironic and even funny that one of the best propagated ideas in our western society today is the idea we should be independent and not easily manipulated individuals. So, it has become the social norm to say of oneself “I’m an autonomous, critical individual, not easily imitating others”. But, by presenting such images of our own ‘independency’, we precisely imitate everyone else desiring a similar autonomy and boasting of themselves in a similar way. René Girard has called the denial of the imitative or ‘mimetic’ nature of a certain, but basic, type of human desire a ‘romantic illusion’ (see Deceit, Desire and the Novel). Anyway, if we frustrate ourselves by adhering an acceptable ‘image’ (and, for example, refuse to recognize our ‘relational, non-independent nature’ as human beings), we might get frustrated by others who don’t seem to follow that image. For frustrating certain desires in order to satisfy our need to obtain a social status only makes these desires grow stronger. So others, who do follow the desires we suppress for ourselves, become a ‘stumbling block’ we want to get rid of. Very often, we can’t stand the confrontation with the fulfillment of our deepest, frustrated desires by these others. We become jealous of them. We would like to imitate their way of behaving, but precisely because we fear to lose our socially acceptable image, we deny being jealous of them. In the end, we’ll even state we find their behavior morally repulsive. Of course, this is a self-deception to comfort oneself. This process is exactly what Friedrich Nietzsche (1844-1900) called ‘resentment’. In Girard’s terms this resentment is part of the ‘romantic lie’, as this feeling once again denounces the mimetic nature of desire – the resentful individual doesn’t recognize being jealous of the one whose behavior he resents. Unlike Nietzsche, Girard doesn’t consider Judeo-Christian tradition as the source of a morality based on resentment, but, on the contrary, as a tradition which precisely uncovers the mimetic tendencies underlying our hate towards others. By expulsing or ‘sacrificing’ the others we consider ‘morally wrong’, we actually try to conjure our own, ‘secret’ desire to be ‘morally wrong’. We try to convince ourselves and the ones of our own ‘group’ that we in no way resemble the ‘others’ we’re expulsing. As a tragic consequence of our enslavement to a dishonest self-image, we will not only victimize others, but we will also develop ways to secretly fulfill our frustrated desires – as they do have become ‘unmanageable’ and ‘too big’ to handle. So our desire to be ‘morally just and socially acceptable’ (‘chaste’) ignites a hypocritical lifestyle. This can be prevented if we are honest about ourselves and acknowledge certain desires in healthy, non-destructive ways – in other words if we, like Mary Magdalen or the adulteress from John’s gospel (John 8:1-11), look at ourselves through the eyes of Grace, and no longer through the eyes of those who might ‘press charges’ against us and who want us to ‘humble’ ourselves ‘in dark pretence to chastity’. That Grace, embodied so eminently by Jesus who ‘loved the sinner but condemned the sin’, indeed ‘reshapes’ sinners and empowers them to ‘sin no more’. Read the full poem by clicking here. 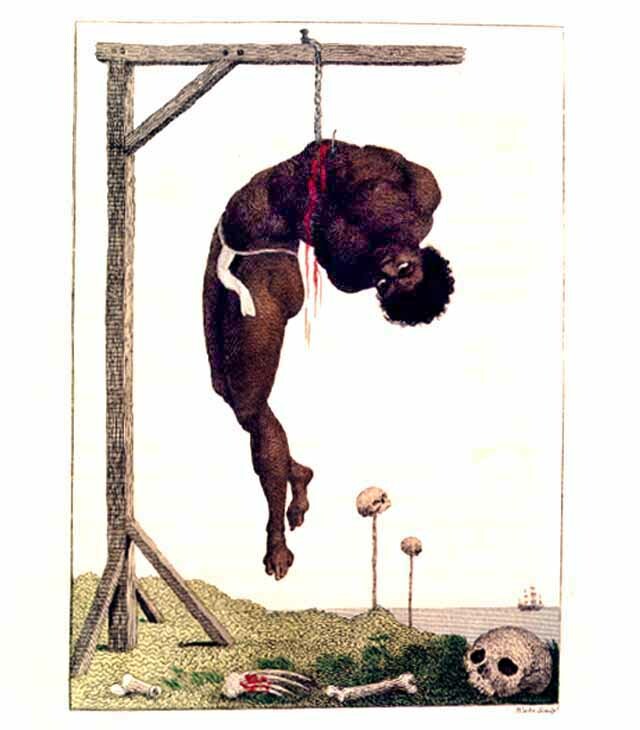 Blake, as a Christian visionary, became very sensitive toward processes of victimization, as this is shown by yet another illustration of his to J. G. Stedman’s Narrative of a Five Years’ Expedition against the Revolted Negroes of Surinam (1796). Till his eyes sicken at the fruit that hangs before his sight? With lamplike eyes watching around the frozen marriage bed!